A velvety soft and light yet luxurious daily moisturizer, to comfort and soften the outer layers of the skin, restore and protect the epidermis and increase elasticity and softness. Essential for winter protection against the elements, that damage and dry out even the most robust skin. Ideal as additional hydration for skin exposed to bright sun light, or those who work in air conditioned environments. 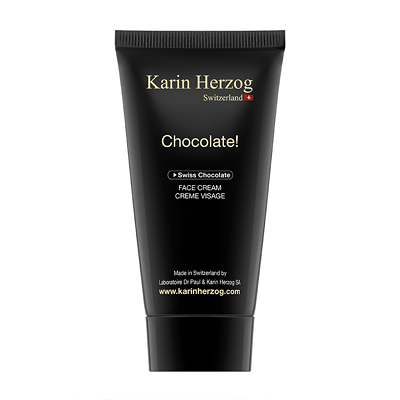 Ingredients include pure Swiss chocolate (just packed with vitamins, lipids and trace minerals), orange and avocado oils to smooth and soften the skin and improve elasticity. The final step to chocolate heaven and a skin that is transformed, repaired, stimulated and ready to face the elements. Chocolate contains essential trace elements and nutrients such as iron, calcium and potassium, and vitamins A. B1, C, D, and E.
Cocoa contains more than twice as many anti-oxidants as red wine, 2 3 times that of green tea and more than 4 -5 times that of black tea. *Magnesium deficiency is linked with hypertension, heart disease, diabetes, joint problems and pre-menstrual tension (PMT or PMS), which explains why so many of us crave chocolate at that time In our menstrual cycle. This cream should be applied in the morning, after Choco2, to provide an excellent texture for perfect make up application. It contains no Oxygen and so should be massaged into the skin. Ingredients: Aqua, Paraffinum Liquidum, Glycerin, Stearyl Alcohol, Polysorbate 20, Theobroma Cacao (Avocado Oil), PEG-11 Esters, Citrus Dulcis (Wheat Germ) Glycerides, Parfum, Methylparaben, Propylparaben.